With it's uncompromising technology, reliability and self-contained architecture, Honeywell's Lynx Plus L3000 is an easy-to-install security system. This Honeywell Lynx Plus L3000 cellular AT&T LTE wireless security system kit includes; (1) wireless control panel L3000, (3) wireless door/window contacts 5816WMWH, (1) wireless pet-immune motion detector 5800PIR-RES, (1) remote 4-button keyfob 5834-4, and a cellular Verizon LTE alarm communicator LTE-L3V. The Lynx Plus is a combination control panel, keypad, siren, dialer, two-way voice system and speakerphone in one. Have peace of mind knowing this L3000 security system kit utilizes a Verizon LTE alarm communicator (LTE-3V) for sending secure alarm signals to the GeoArm central monitoring station. The Verizon LTE radio communications module easily install's inside the same plastic case, as the Lynx Plus, with no additional enclosures to mount. The new communications options give you the flexibility you need to address the emergence of VoIP, POTS migration to cellular and the growth of digital radio networks. The all-in-one integrated design combines the installation flexibility for every job with the proven reliability of Honeywell's technology. The convenient voice prompt programming feature walks you through the installation process helping reduce installation costs. The voice annunciation of system status and alarm conditions greatly reduce the amount of end-user training. Lynx Plus supports all Honeywell 5800-Series wireless devices, including the 5828 and 5828V wireless keypads. The Lynx Plus do-it-yourself home security system is user-friendly and puts security and convenience at your fingertips. The vibrant, easy-to-read display is easier to use than traditional security systems. The L3000 wireless alarm control panel announces the exact type and location of any alarm in plain English and gives you the information you need so you can react quickly. The Lynx Plus all-in-one control panel, keypad, and siren is encased in a sleek, stylish and portable wireless security system that blends with any decor. The Lynx Plus security system is backed by Honeywell's 2-year limited manufacturer's warranty and is compatible with the full line of Honeywell's 5800-Series wireless security products. AlarmClub and Honeywell give you the options you need to fully customize your DIY home security system. For peace of mind, you need to know that what you cherish most, your family and your home, are safe and secure. 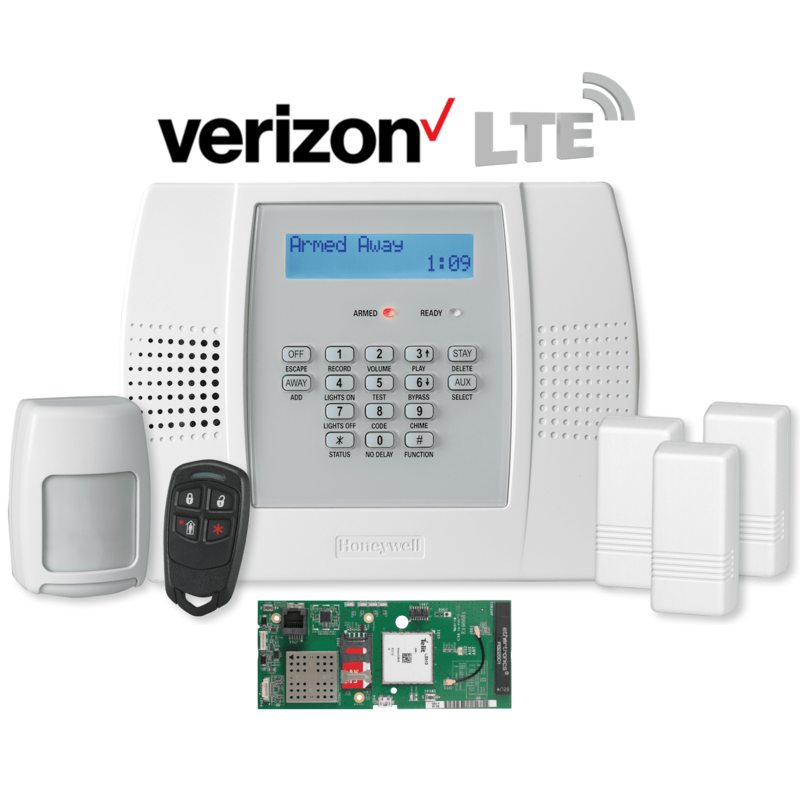 Look no further than Honeywell's Lynx Plus cellular Verizon LTE security system. The Lynx Plus cellular security system provides superior home security, protecting your property and the people you love. But the Lynx Plus also does so much more than keep you safe. With the rise in cell phone use, more and more people are looking to save money by eliminating their traditional phone service. However, in the past, anyone with a monitored security system was required to have an active phone line to send the alarm signals. A major benefit of the Lynx Plus cellular security system is that it uses the wireless cellular Verizon LTE network to send out all alarm signals. Now you can eliminate your monthly phone bill and still get low-cost professional alarm monitoring. Also, the Lynx Plus cellular security system can be upgraded with AlarmClub's Total Connect interactive alarm monitoring service, which enables you to receive important alerts, keep a close eye on your home and control your security system remotely via the Internet and/or mobile devices you use each and every day. Isn't it time you got connected? Save money and take control of your home security with AlarmClub. The benefit of the Lynx Plus cellular security system is that no connection is needed for the alarm communications. The cellular alarm signals are sent wirelessly right from the Lynx Plus alarm control panel over the Verizon LTE cellular towers. Therefore, to complete your DIY home security installation, simply plug in the Lynx Plus transformer into a standard wall outlet. When choosing your installation location, make sure there is an open wall outlet nearby. AlarmClub also recommends installing the Lynx Plus cellular security system in a location that is not near an entry/exit door, such as a utility closet or master bedroom. If the Lynx Plus alarm control panel is installed near an entry/exit door, an intruder can potentially disable the system before the entry delay times out. If this happens, AlarmClub's central alarm monitoring station would not receive the alarm signal since the Lynx Plus alarm control panel and/or alarm communicator has been destroyed. A Lynx Plus wireless 5828 keypad installed at the entry/exit door would provide full system control and allow you to install your Lynx Plus cellular security system in a secure remote location. When designing your system, keep in mind that the Honeywell Lynx Plus cellular security system supports up to (40) wireless zones/devices. AlarmClub includes (3) wireless devices in the base kit along with (1) 4-button wireless keyfob, so make sure you do not add more than (33) additional Honeywell security devices to your Lynx Plus cellular security system.